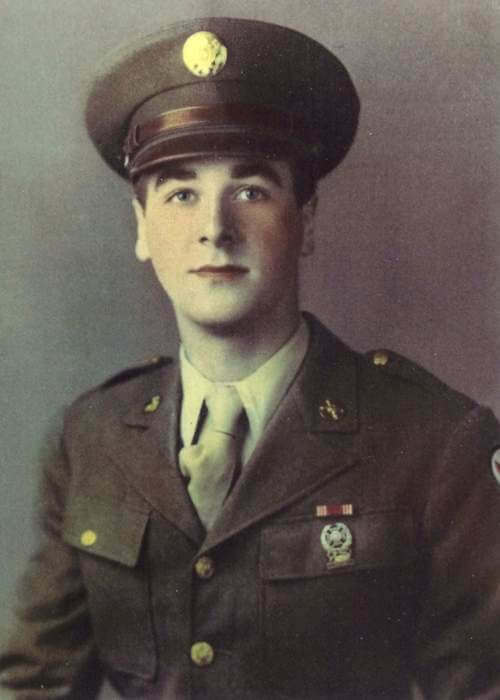 PFC Bruce Klein served in WWII in the 103rd Infantry Division. His unit was responsible for liberating the Dachau concentration camp in Germany. Some years ago, his medals were lost in a move, so he enlisted the help of the local VA center to replace them. The request was processed, but the medals never made it to Klein’s home. He was surprised to hear from Purple Hearts Reunited and pleased that his medals had been found. Klein received the Bronze Star for the first time; unbeknownst to him, WWII Infantrymen who earned the Combat Infantry Badge were retroactively awarded the Bronze Star for their service. Klein, who will celebrate his 91st birthday in February, brought his wife and two daughters to the event. In addition, Dachau survivors Al Beder and Howard Melton were in attendance to honor PFC Klein, as were representatives of the Nathan and Esther Pelz Holocaust Education Resource Center.